Get Vendio Gallery - Now FREE! Antique French PUIFORCAT Sterling Silver 48pc Flatware Set, Ornate Pattern. All items and photos are the express property of Antiques & Uncommon Treasure. No reproduction without prior written consent. We'll be sending out sale notices and special deals to our'Favorites' customers. Beautiful antique French sterling silver 48pc flatware set, a 4pc table setting for TWELVE with elegant, ornate pattern, interlaced monograms and hallmarks for the world renowned House of PUIFORCAT! This set is in the Louis Philippe style, c. 1838, though we do not know a pattern number or name. It was quite common for prominent silversmiths to outsource some work when overly busy and they often had a small handful of expert, reliable silversmiths with whom they worked. The French Minerve or Minerva hallmark on all pieces, the tiny #1 mark within those marks are the French guarantee for. 950/1000 finest pure silver, 95% pure and highest standard for sterling silver in the world. The French also cast/make pieces at a very thick gauge, so they are surprisingly heavy compared to lesser English and USA silver, as an example. And in comparing these pieces, the spoon is about the size of a USA tablespoon. 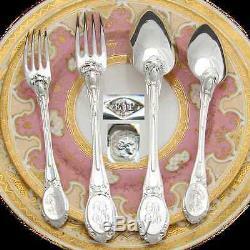 This is a superb set including twelve each in the large dinner and luncheon or'entremet' services. We also have a great set of vermeil, or 18k gold on sterling silver, dessert pieces in the same pattern, those with armorial style engraved crown topped heraldry rather than monograms but a superb addition to this set and your fine dining ensemble! YES, the Holidays are right around the corner, time to start thinking about entertaining and family get-togethers, wow them (and yourself)! A traditional wedding gift, these magnificent French sterling silver flatware sets were almost always packaged without knives. Another French tradition has to do with the gift of knives or a knife as a symbol of the cutting or ending of a relationship. And no where on earth is tradition more important, perhaps, than to the French culture. So, in light of the symbolism of the gift, knives were not part of a wedding gift, not packaged or even usually made with the matching pattern of the forks, spoons in a set, and are something added later and as compliments to the table's sterling silver choice. And ever the center influence in fashion, this also opportuned the happy result of knives made in coordinating and complimenting fashion with handles of rich elegant mother of pearl, fine ivory, blond natural horn, or exotic hardwoods like ebony (a French Empire'must') walnut, rosewood. The result is that you can add sets of knives to compliment and define your table setting. Extremely fine all, don't miss them! Some light surface scuffs here and there, indicative of light use but no damage or repairs to note. There may be a few knife marks on some of the fork tines but nothing you wouldn't expect with the age. Some slight bit of dark tarnish marks in the raised decoration (sorry), all would come out with a good polishing though the rest of each piece, as you can see, has a fine polished luster. The two sizes are each held in their own black leatherette storage and/or presentation box, both boxes in great shape as you can see in the images. Interior of the boxes has a gold embossed stamp that reads "Lautier Orfevre Toulouse". See pictures for individual weights and measurements. Image Hosting by Ruby Lane. We're easy to deal with. Our fine inventory is very important. And your ranking of our performance is also very important! We wish to keep our 4.9 - 5 star ratings in all categories. We always insure our items BUT, more importantly, pack them extremely well knowing that most are not replacable. Please remember that when leaving DSR ratings. Listing created with eLister 3.1.2 for Macintosh. The item "Antique French PUIFORCAT Sterling Silver 48pc Flatware Set, Ornate Pattern" is in sale since Sunday, November 20, 2016. This item is in the category "Antiques\Silver\Sterling Silver (.